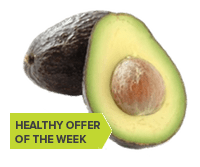 Save 20% on any single purchase of loose Avocados at participating retailers. It’s a beautiful day out. This week is supposed to be very warm and it’s likely we will all be looking for dinners that don’t require an oven. Guacamole is one of our favorites. I will share our favorite guacamole recipe. It is very simple. Peel the avocados and remove seed. This is easiest if you cut them them lengthwise through the peel all the way around. Then pull apart and use a spoon to scoop the seed out. Cut avocados into 1 inch cubes. Place in a large mixing bowl. Chop up cilantro and onion. Add onion and cilantro to the avocados. Use a potato masher and mash them together into a paste like consistency. Chop tomatoes and add them to the bowl. Stir gently, so they don’t get mushy. Add salt and pepper to taste. We like to squeeze lime juice in and mix. It not only adds a lot of flavor it helps to keep the guacamole from turning brown.